Here is a technical correction to my previous newsletter: The "cute" little radioactive gizmos from Toshiba are cooled with liquid sodium, not lithium, as previously described. To shut the reaction down, reservoirs of lithium-6 are emptied into the coolant loop. In the copy of my previous essay shown below, the paragraph that starts "The Toshiba baby-nukes will rely..." has been modified to reflect this correction. My apologies. Of course, this correction assumes Toshiba's newest nuke is a scaled-down version of their 4S prototype "mini-nuke." The 4S, in turn, is basically a scaled down version of an older 50 megawatt breeder reactor which was deemed not viable for large-scale situations decades ago. Small-scale nuclear power appears viable because its proponents pretend the nuclear waste problem has been solved, and the spent reactor cores can be safely trucked away to a place that doesn't exist, except in politician's (and pro-nukers) dreams. Small-scale nuclear power appears viable because the government has learned how to write earthquake and tsunami and other specifications which do not reflect the real world. Manufacturers then claim to meet these "standards," and say their reactors are "earthquake-proof" and "tsunami-proof" when they are nothing of the kind. Small-scale nuclear power appears viable because Toshiba (and others) pretend that all the metallurgical issues are well understood. Just look at how many large parts of older nuclear reactors are falling apart, such as their steam generators, which were supposed to last the entire extended life of the plant. Or look at Davis-Besse, which in 2002 had a nearly catastrophic "hole in its head." Small-scale nuclear power also appears viable because people pretend that terrorism doesn't happen. Toshiba's mini-nukes are being advertised by the manufacturer as "zero maintenance" but that applies ONLY to the reactor core itself: Not to all the pumps, pipes, valves, and vessels of the steam generator / turbine energy conversion system. The commentary below describes some of the difficult work that is entailed in operating a steam generator, and below that is the corrected version of my previous newsletter. (From a reader): "Atomic Insights newsletter, points out something very practical -- the designers and marketers spend all their time describing the nuclear reactor side of things, and no time on the power plant steam generation side of things. The author makes good points." "The 4S is a very nice reactor system, but my reading of all available materials indicate that only passing attention has been paid to the secondary (steam) side of the plant. As is common among plant design documents produced by nuclear engineers, there are dozens to hundreds of pages of details about the reactor system and a few paragraphs about the "balance of plant" (BoP). Though steam is an old and well understood technology, it is not particularly simple or cheap. There is a reason why there are few steam plants being produced today, the plants tend to be labor intensive, heavy, and relatively expensive compared to alternatives like diesel engines or gas turbines. I spent a lot of time early in my career supervising the operation and maintenance of a steam plant that was almost exactly the same capacity as the one proposed for Galena. I will admit that it was a rather venerable and well worn system by the time I arrived, but I am pretty sure that many of the maintenance issues that made for some long days have not disappeared. Steel steam piping still rusts, packing around valves still wears out, condensers still need periodic cleaning and inspection, steam leaks are still potentially deadly for operators, steam generators still require careful chemistry control and monitoring, water purification systems are still a must, and turbine bearing lubrication oil systems still require careful attention." Toshiba, famous for electronics products around the world, plans to build "small" (room-sized) fully-automated nuclear reactors. These new reactors are just 1/5000th the size of today's old, massive, deteriorating (and did I mention unsafe?) boiling water reactors (BWRs) and pressurized water reactors (PWRs). But, each new reactor will still contain enough lethal poison to wipe out a city. Today's reactors are operated by about eight hundred to a thousand people each, and produce an average of about one megawatt of electricity per employee. Toshiba's proposed new reactors are completely automatic -- NOBODY operates them. Nobody guards them. Nobody even watches them. An apartment complex for the rich can guarantee itself steady power "for up to 40 years" according to the (optimistic) manufacturer. The cost is rumored to be about $3.5 million. After the 40 years are up, not only will the fuel need to be stored for millions of years, but the entire reactor will have to be isolated from humanity on a finite planet with limited resources. WHO will pay for THAT? Whose land will Toshiba take to store the waste? Even after 60 years, tens of billions of dollars, and thousands of the world's best scientists working on it, NOBODY knows what to do with radioactive waste BECAUSE IT DESTROYS ANY CONTAINER YOU PUT IT IN. Toshiba plans to bring the first of the new reactors online in 2008 in Japan, and in Europe and America in 2009. They are that close to production of these awful things. So boycott Toshiba. Let them know that pocket nukes are a bad idea. The energy source used in the new Toshiba reactors is the same uranium-based fuel used by just about every other nuclear power plant, which, of course, should also all be closed down in favor of alternative energy sources. Renewable energy solutions are available, affordable, and effective today, but they don't make millions of dollars for large utilities. They make it for the average citizen who invests in solar panels, wind turbines, and such. So I say: Break up the utilities! It should be illegal to make electricity AND be in control of the distribution grid. It should be illegal for utilities to refuse to purchase renewable energy at fair prices. A properly-thought-out renewable energy system would have thousands of small sources, and could therefore be very reliable even if some of those sources shut off for parts of every day. The Toshiba baby-nukes will rely on a closed-loop sodium primary coolant system, instead of water. Reservoirs of Lithium-6 are designed to serve as a moderator to stop the reactor if necessary, the manufacturer claims. Firefighters will have to treat a Toshiba pocket-reactor fire completely differently from what they are equipped for, trained for, or capable of handling. Worse, the Toshiba reactors can be blown up by a bomb, which means: Osama will love them. He would love Toshiba to sell thousands of these "dirty bombs" throughout America. But even worse is the terrorist lurking in the structural quality of the materials used in these petite power generators, which contain enough radioactive uranium and various fission products and transuranics to cause cancer to tens of thousands of people, even millions, if the radioactive material were to be released for any reason: Earthquake, tornado, tsunami, terrorist, poor workmanship, poor materials, poor design, etc. In addition to these "baby nukes," Toshiba also wants to introduce a line of midsize nukes, called the 4S series ("Super, Safe, Small, Simple" they say), with fuel enriched to 19.9 percent U-235. (Highly Enriched Uranium, by convention, is enriched to 20.0% or more U-235.) The new 200-kilowatt nukes are said to be small versions of the 4S design -- just what Osama is looking for! Techno-nerd's reactions to the new reactors on the Internet would make you think these were puppy-dog-friendly, never-could-harm-a-flea energy sources. But the articles are being written by geeks who know nothing about nuclear waste issues, or terrorism, or economics. They just love the idea of "unlimited" cheap power. Well, they should all look under the hood a little harder before they endorse these things. Toshiba is also involved (with General Electric) in large BWRs. And in October 2006 Toshiba purchased what used to be called Westinghouse from British Nuclear Fuels Ltd. (BNFL) for about 5.4 billion dollars, adding PWR manufacturing and support to their portfolio. Toshiba's purchase of Westinghouse, of which only the nuclear division existed anymore, possibly prevented a perfectly appropriate bankruptcy of BNFL, who had bought the ailing Westinghouse in 1999 for about 1.1 billion dollars. Mainly through its new Westinghouse subsidiary, Toshiba now has half a dozen different reactor designs they are certifying with nuclear agencies around the world -- with almost ZERO public scrutiny! The purchase of Westinghouse seems to have invigorated Toshiba to be completely arrogant about nuclear energy at all levels. Nuclear reactors and equipment for those reactors (and for other reactors) accounts for about 25% of Toshiba's business. Completing the cycle of greed, Toshiba's nuclear ambitions will ultimately mean more business for Toshiba's Computed Tomography (CT) and Magnetic Resonance (MR) machines, which they sell to hospitals and which are used to diagnose (NOT cure!) 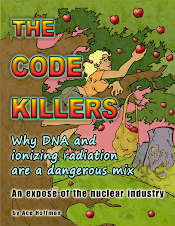 the very diseases Toshiba's new nuclear reactors will cause. So boycott Toshiba. Boycott Toshiba laptops. Boycott Toshiba camcorders. Boycott Toshiba hard drives. Boycott Toshiba telephone systems. Boycott Toshiba DVD players. Boycott Toshiba. Return Toshiba gifts you received for Christmas. Remove Toshiba stock from your portfolio. Bankrupt them, if necessary -- anything to stop their ability to support nuclear power. AREVA: Once again this French company appears to be the culprit! The Bush Administration pushes nuclear power without concern for human life, especially the lives of infants and children. In Bush's simplistic view, cancer is something to be cured by irradiating you, not something to be prevented in the first place, by cleaning the environment of radiation. But behind the scenes, a French company named Areva does most of the dirtiest pro-nuclear work around the globe. Areva loves Bush, and Bush loves Areva. Despite any comments you might recall Bush saying about the French when they weren't fooled into going into Iraq, the Bush Administration has had a very cozy relationship with Areva all along. Recently Areva signed the largest nuclear power plant deal in history, worth about U.S. $12 billion, for two reactors in Guangdong, China. They also promote nuclear energy interests in Canada, South Africa, India, Libya, and many other countries. Areva is an international criminal organization run by a ruthless megalomaniac named Anne Lauvergeon. However, 94% of Areva is owned by the French government, who can be no less ruthless. It makes for a very effective covert system, since whatever Areva needs that laws or public scrutiny forbid a corporation from doing, the French government can -- and will -- do instead. Massive funding for pseudo-scientists promoting pro-nuclear "solutions" to global warming results in a misled media, a misled public, misdirected national policies, and a doomed planet. Nevada suffered from cancer in large numbers. The BEIR VII study. only safe dose is zero. downwind are routinely exposed to low levels of radioactivity. The U.S. nuclear power industry stopped growing in the mid-1970s. Washington have laid the groundwork for an industry revival. though evidence of harm exists. Since March 1993, utilities have submitted 99 requests to the U.S.
considering 12 more applications, totaling another 1100 megawatts. by 15 to 20%. Almost all sailed through with little public opposition. so it requested a 20% upgrade for Vermont Yankee -- the oldest U.S.
shouldn't be allowed to operate. It should be shut down." a total of 60 years. Dozens more applications are expected. 104 U.S. reactors and one of the smallest (636 megawatts electrical). unexpectedly high cancer death rate (8.8% above the U.S. average). number of "excess cancer deaths" exceeds 6,000.
old reactors more hours per year raises safety and health concerns. Point, it raised the current productivity rate to 95%. private bankers have flatly refused to put up the other 10%. Constellation teamed up with the French company Areva to form Unistar. million. With financing secured, the new reactor was ordered. reactor would begin operating in 2014.
poverty rate and good access to medical care in Washington. Calvert County is a healthy place -- with the exception of cancer. cancer rate rose to 13.8% above the national average. All local leaders support the new nuclear plant at Calvert Cliffs. provide resources that produce energy." terrorist attack beyond anything we have yet imagined. too dangerous, and too unnecessary to warrant further support. Questioned. New York Times, January 26, 2004. Eesha Williams, Hundreds Attend Hearing on Vermont Yankee. Transcript of New Hampshire Public Radio broadcast, April 1, 2004.
and ICD-10 cancer codes C00-D48.9 (1999-2004). Vol. 317 (2003), pgs. 37-51. Health Services Vol. 36, No. 1 (2006), pgs. 113-135. Janet Tauro, But Safety Issues at Oyster Creek Can't Be Ignored. Asbury Park Press, September 9, 2007. Division of Planning, Budget, and Analysis. Information Digest. Plant. Washington Post, August 15, 2007. Vt. (9.0%), Ocean County, N.J. (7.6%), Westchester County, N.Y.
was higher for Windham County, Vt. (87.3%), Ocean County, N.J.
(83.0%), Westchester County, N.Y. (83.6%), and Calvert County, Md.